For the fourth consecutive year, exports of Cognac have increased, reaching record numbers in both volume and value. 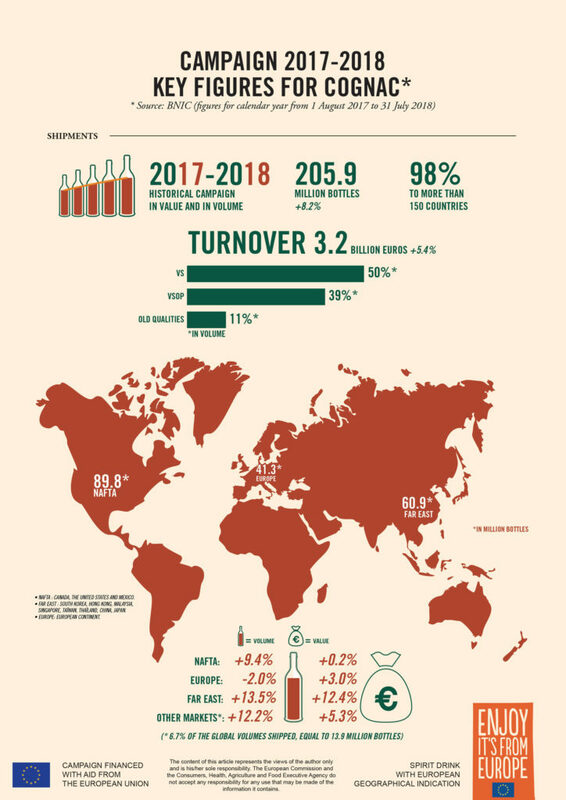 With nearly 98% of total production exported, the Cognac appellation continued to grow its export markets in 2018, with growth of more than 3% in volume and 2% in value. 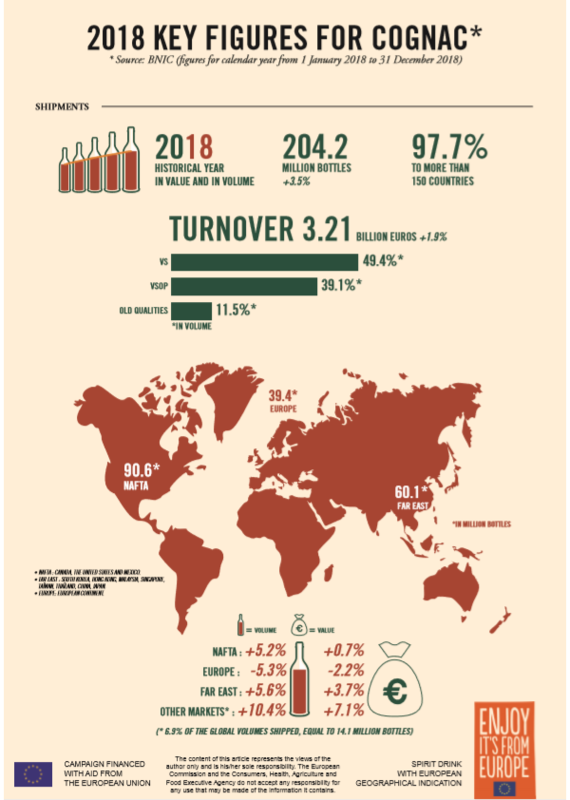 204.2 million bottles of cognac were shipped in 2018 – resulting in 3.2 billion euros (roughly 3.6 billion dollars) in revenue. Cognac exports to the NAFTA Zone (represents 44.4% of exports) continue to make progress, with 90.6 million bottles shipped in 2018 for an increase of 5.2% in volume and 0.7% in value. The United States continues to be Cognac’s largest market with 87.4 million bottles shipped in 2018. The East Asian market continues to grow, with 60.1 million bottles (an increase of 5.6% in volume and 3.7% in value). The exports to China continue to drive growth in the zone despite a slight decrease during the second semester. Continental Europe exports have declined (-5.3% in volume and – 2.2% in value), for a total of nearly 39.4 million bottles shipped. This decline can be attributed to the difficult economic and political times in some of its markets. Increased exports also continue in other areas with high potential for Cognac in countries such as South Africa, Vietnam, and the Caribbean. Exports to these markets rose by 10.4% in volume and 7.1% in value. Additionally, these new areas of opportunity represent more than 6.9% of total exports, or nearly 14.1 million bottles. The export of V.S. (50% of total volume), and V.S.O.P. (almost 40% of total volume) continue to grow in volume and are up by 2.6 and 3.5% respectively. Value for both remained stable (only down by 0.3%). Representing 11.5% of total volume, the older categories witnessed a growth of 7.5% in volume and 6.3% in value. With a total volume yield of 126.8 hl/ha (compared to 88.95 hl/ha for the previous harvest) or a yield of pure alcohol of 13.06 hl AP/ha, the production in barrels will be between 970,000 and 980,000 hl AP. This level of production would be greater than the region’s original business objectives which had been estimated at 902,000 hl AP put in barrel this year, a figure that many trade professionals feared would be too low to meet the demand. 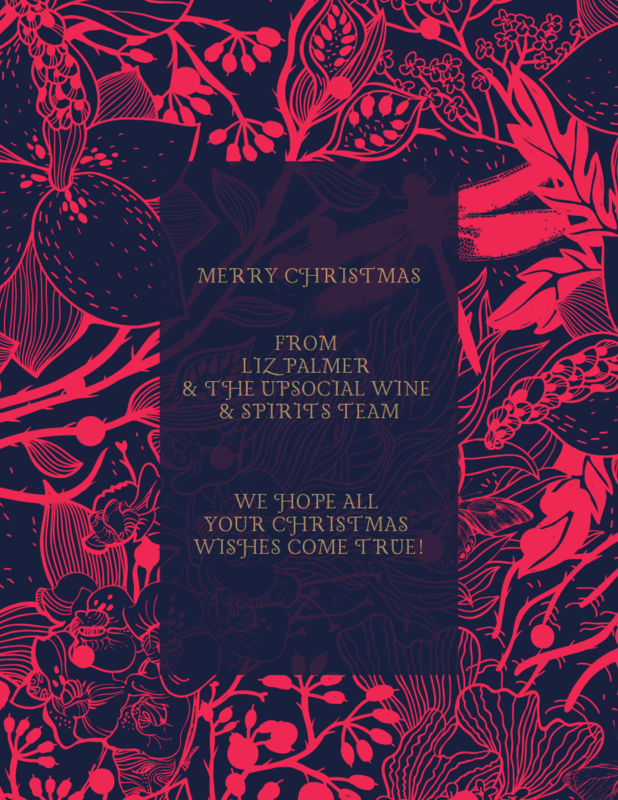 Happy Holidays from Liz Palmer and the UPSocial Wine & Spirits Team!! Author lizpalmerPosted on December 16, 2018 December 16, 2018 Categories Articles, Champagne, Cognac, Social Media, TechnologyTags 2018, Christmas, Happy Holidays, Liz Palmer, UPSocial Wine and Spirits AgencyLeave a comment on HAPPY HOLIDAYS….. Launching February 2019, LOUIS XIII will step into the future by integrating NFC technology into its Smart Decanter to provide clients a seamless access to an exclusive world of privileges. 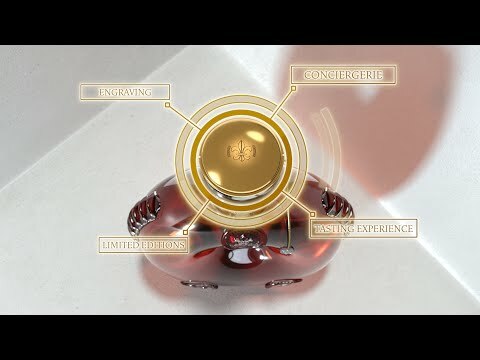 Each decanter will directly connect clients to the LOUIS XIII Society, a private club where members can enjoy exclusive content, unique experiences and personalized services through their smartphones. After removing the seal, clients can tap and scan their NFC-enabled smartphones on the cork stopper to access the LOUIS XIII Society landing page to create or log into their account. The decanter number will then be automatically registered. With this NFC chip, LOUIS XIII clients will get facilitated access to all the advantages of the LOUIS XIII Society. This private club offers bespoke services such as customized decanter engraving, pre-releases of limited editions, contact with a LOUIS XIII Personal Advisor for private tastings and ultimate experiences, and an invitation to network with LOUIS XIII Cognac connoisseurs registered all over the world. In addition, the LOUIS XIII Smart Decanter will bring added services to clients allowing them to customize gifting messages that will appear when recipients scan their decanter. NFC enables simple, rapid, intuitive and secure communication between two electronic objects. A mature and robust technology which has been growing in the past 20 years being used mainly by bank cards, biometric passports and travel tickets – until now. Today, with the introduction of contactless payment, connected wearables and the Internet of Things, NFC technology is reinventing the way we experience life. France’s Elysée Palace has officially opened its doors to its wine cellar first time this past weekend as part of a bid by President Emmanuel Macron to promote national heritage. There were 350 members of the public who toured the cavernous cellar which houses 14,000 bottles, from all the wine growing regions of France. “This is the first time we’ve opened the cellar to the public,” Virginie Routis, the Elysée’s sommelier for the past 11 years, told Europe 1 radio. The three-meter high vaulted cellar is two floors below ground level and keeps a plethora of fine wines and spirits, from cognac to top champagnes, at an ideal temperature of 13 degrees Celsius. 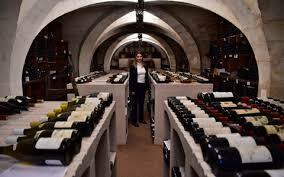 The also cellar contains prestigious vintages such as Cheval Blanc, Latour, and Puligny-Montrachet. Its oldest bottle is said to be a 1906 Sauternes. “The wine is chosen according to the menu. I make a selection…Madame and Monsieur Macron also get to approve the choice. We really have to represent French gastronomy, so you have to choose wines that speak to a given foreign delegation,” she said. The cellar was designed in 1947. During Jacques Chirac’s presidency in 2013, some 1,200 bottles were auctioned off as the quantities were too small to serve at official dinners. Unlike his teetotal predecessor Nicolas Sarkozy, Mr. Macron is quite knowledgeable on French wines and has confessed to drinking a glass of wine at lunch and dinner. He has chosen to open the cellars as part of France’s annual Heritage Days, where numerous state and listed buildings are exceptionally opened to the public. For the fourth straight year, exports of Cognac have continued their steady rise, with an increase of 8.2% in volume and 5.4% in value. The previous record of bottles shipped (200 million) has been surpassed, with 205.9 million bottles shipped between August 2017 and July 2018. With 3.2 billion euros (roughly 300 billion dollars) in revenue, Cognac contributes significantly to France’s trade surplus in the wines and spirits sector, accounting for nearly a quarter of the total value of French wine and spirits exports and placing Cognac at the top of the major appellations. Cognac consolidated its position in the NAFTA zone with 89.8 million bottles shipped. This translates to an increase of 9.4% in volume and 0.2% in value, in the 9th consecutive year of growth2. The United States remains the leading market, with 86.5 million bottles shipped during the period. “The brown spirits category is growing in the US market. The historical presence of cognac and the constant investment by the Cognac houses in this market have reinforced the performance of cognac in the U.S.,” explains Patrick Raguenaud, President of the Bureau National Interprofessionnel du Cognac (BNIC). Shipments to continental Europe remain stable with a slight loss of 2.0% in volume but a rise of 3% in value, for a total shipment of more than 41.3 million bottles. These results are due to a small decrease in exports to western and northern Europe and growth in Russia and Latvia. “Particularly in the United Kingdom, our largest European market, shipments remain stable, despite the uncertainties of Brexit,” says Patrick Raguenaud. Increased exports also continue in other areas, with strong potential for Cognac in countries such as South Africa, Vietnam, Oceania and the Caribbean4. Exports to these markets rose by 12.2% in volume and 5.3% in value. All together, these promising markets represent more than 6.7% of total exports, or nearly 13.9 million bottles. Representing 50% of total volume, the V.S., V.S.O.P. and older categories—including Napoléon, X.O. and Hors d’Âge—continue to play a prominent role in Cognac’s strong performance5. The success of V.S. (minimum 2 years aging) cognac continues to be driven by the North American market–which accounts for half of all cognac shipments—growing in volume by 6% and in value by 4.1%. Representing a little less than 40% of the production, V.S.O.P. (minimum 4 years aging) shipments increased by 10% in volume and 2.1% in value. Napoléon (minimum 6 years aging), X.O. and Hors d’Âge (minimum 10 years aging, respectively) are also experiencing significant growth with a rise of 12.4% in volume and 10.3% in value, thanks to strong results in East Asia. According to Patrick Raguenaud, «the good momentum we are experiencing today in these three quality-designated categories can be explained by cognac’s strength in all markets, with varied consumption patterns. According to the Fédération des Exportateurs de Vins et Spiritueux de France (Federation of Exporters of Wines and Spirits of France) and the Fédération Française des Spiritueux (French Federation of Spirits), 2017 saw French spirits exports reach new records and break the € 4 billion mark, for a total of 437 million liters (an increase of 2.4%). Cognac, accounting for 70% of the value of spirits exports, gave a strong boost to the overall value. In addition, Cognac now represents nearly a quarter of the total value of all French wine and spirits exports. Source: Bureau National Interprofessionnel du Cognac (BNIC).